A brush for everybody, whether you are looking for a natural fibre brush for dry body brushing or one to use in the shower, we have the perfect Eco Max Body Brush for you. All Eco Max Brushes are registered with The Vegan Society and are ethically handmade in Sri Lanka using 100% natural vegetable fibres. Eco Max Body Brushes, a plastic free alternative for natural body care, good for you and the planet. A soft bristle face brush handmade from natural jute. Ideal for for dry brushing the sensitive areas of the face and decolletage. Avoid scrubs that can dry out your skin by using a dry face brush twice weekly. This stimulates the natural oils in your skin while exfoliating, leaves the face feeling smooth and gives you a healthy glow. The wooden pins on the Eco Max hairbrush give a gentle massage to the scalp while brushing without causing static. Made in Germany using FSC (Forestry Stewardship Council) certified timber it is Vegan friendly, sustainable and biodegradable. So it is good for you and the planet. The Eco Max Foot Brush is handmade from natural coconut fibre that is hard strength and ideal for wet or dry use. Combine with your favourite soap and give a rigorous scrub for your feet to remove grime and dead skin cells. The Eco Max Back Brush with Cotton Cords is a medium strength sisial brush for wet or dry use that you will bend and shape to the contours of your back. Popular with men, this brush is perfect for a firm scrub from top to tail. The Eco Max Travel Brush is the ideal size to use as a travel dry body brush or it can be used wet in the bath or shower. 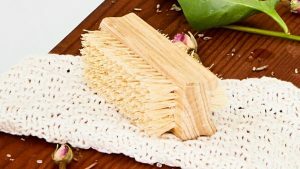 Dry body brushing is a completely natural way to gently exfoliate, while increasing circulation and stimulating the lymphatic system to help detoxification.